The continuing popularity of Downton Abbey, the runaway hit chronicling the lives and loves of an aristocratic English family in the early 20th century, has inspired renewed interest in the style of the period.The Edwardian era stretched from c1890-1915. 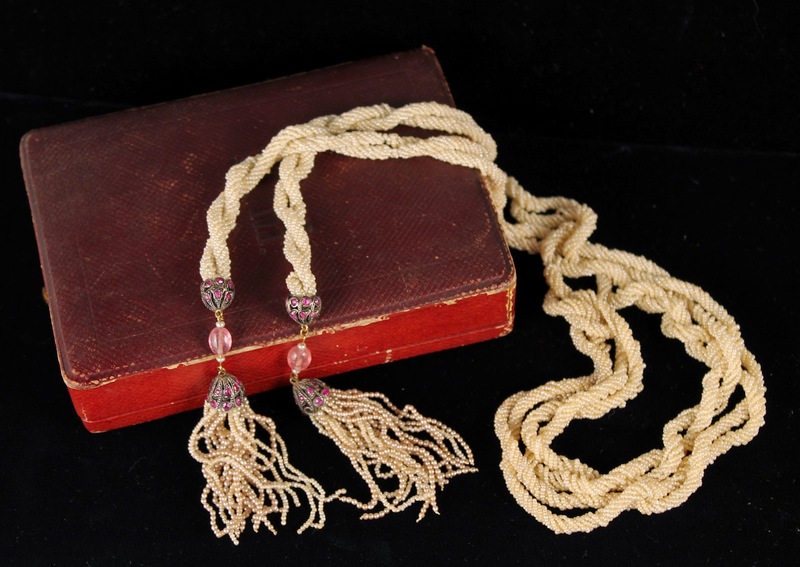 This seed pearl and natural ruby sautoir (or tassel) necklace is a beautiful example of turn of the century jewelry that might have been worn by Lady Cora or Lady Mary at Downton Abbey, particularly in the early Edwardian period. A sautoir is a necklace that is a long single strand, in this case fabulously constructed from a cascade of delicate seed pearls, without a clasp or closure. This type of necklace gained popularity at the close of the 19th century in response to the lengthening silhouette of women's fashion during the Edwardian age. The sautoir was a striking accompaniment to the elongated, columnar dresses, whether worn loose down the back, or looped around the neck like a scarf. This necklace is set with an abundance of natural rubies which complement the dramatic seed pearl ropes and tassels quite nicely. The natural beauty of the pearls and gemstones is more common in earlier Edwardian pieces, before the aristocracy's love affair with platinum and diamonds really took over. This particular necklace is a fine, earlier example. As the Art Deco movement gained popularity in the 1920s, sautoir necklaces began to reflect the design principles of the movement with bold geometric pendants set with diamonds. Edwardian jewelry was often delicate and light, constructed in platinum over yellow gold. The brooch above, an Edwardian sapphire platinum and 14k gold filigree brooch is a classic example of the type. Platinum and diamond were the most popular combinations in jewelry of the time; sapphires were considered a striking and desirable contrast to platinum as well. Later Edwardian jewelry was typically a monochromatic palette of sparkling colorless diamonds against platinum. The transitional pieces from the Edwardian to Art Deco period of jewelry design can be quite beautiful. Explore antique Edwardian jewelry in our store. Or visit us online for other jewelry, antiques, and rare objects.